Farm Stay Kent provides links to independent holiday accommodation on working farms. These can be bed and breakfast, or self-catering cottages. We also provide opportunities for camping. Our members are rural retreats, tucked away from the madding crowds, but close enough to allow day trips to the many historic towns and cities, or visits to ancient castles and historic monuments. Most of our Farm Stay members are based in and around Faversham, Ashford and Canterbury, and along the Kent Downs, the part of the North Downs that runs from the London-Surrey border down to the White Cliffs of Dover. 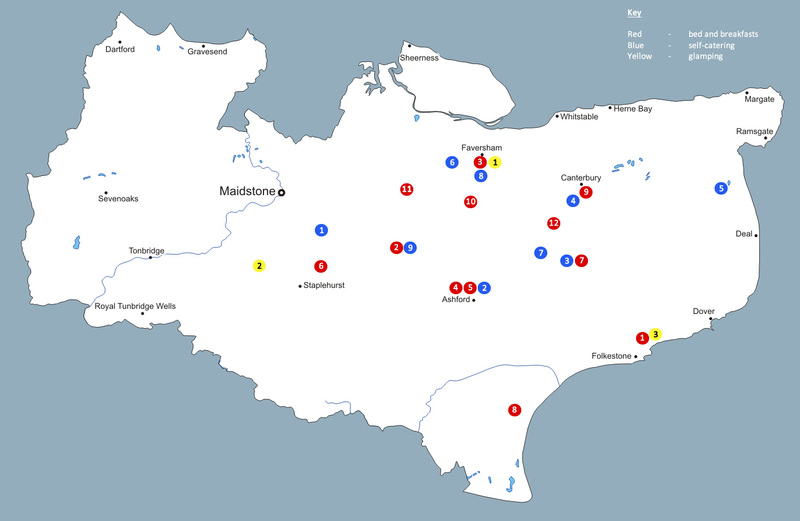 Browse our colour-coded map below for the type of accommodation (B&B, self-catering or camping) or by location, then click on the link below the map to find out more about a particular Farm Stay location, and check the facilities on offer (such as Wi-Fi, disabled access, or family/pet friendly).